I believe the swan is one of the most common origami folds. I think that almost every origami book has instructions for a swan. The idea behind it is pretty simple. 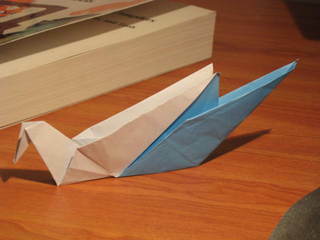 Get to the crane, unfold the back part, and reverse fold up, and align with the wings. I can upload pictorial instructions if anyone is interested. This entry was posted in Origami and tagged Origami, Swan. Bookmark the permalink.